Lately my three-year-old brown baby has become aware of skin color. She points out all the black children at the pool and the store. Sometimes she seems pulled toward them. Other times she seems not to have any interest, she’s just pointing out a fact. A few weeks ago, I bought the new Mavis Staples CD. When Josie asks for her it comes out sounding like mabitaple and she always wants to listen to her LOUD. I’ve told her teachers and grandparents that if they can’t figure out what she’s saying, she’s probably asking for Mavis. We’d only listened to the CD a few times when Josie found the jewel case sitting on the front seat of my car. She picked it up and stared at the picture of Mavis. We talked about how pretty she is – what a nice smile she has. Josie started calling Mavis her bootiful fwiend and carrying the case around, holding it close to her chest. For the rest of the post, click on over to www.mybrownbaby.com. 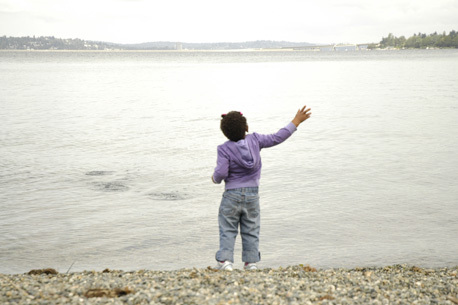 This entry was posted in Adoption, Baby Girl, Bi-racialness, Parenting, Popular on March 7, 2011 by Katherine. I just have to say that if you look at the picture of Josie in the Meow post and you look at the picture of Mavis, the resemblance is remarkable. Maybe she is seeing herself all grown up. Wow, this Grandma is going to take that as a major compliment from Josie. How sweet. Hug her for me. Interesting! I’m waiting for Theo to say something. But he lacks words. I always show him Sesame St videos featuring awesome black singers. Interesting times head for sure. oh how I love this. Your girl is very blessed to have you, such a present and conscious mama.